Tagged under Yaeko Ninagawa, Toei Animation, Series. Unique in every way, and intriguing beyond belief. This anime, along with House of Five Leaves have become my all-time favorites-and I recommend them to anyone willing to try quirky on for size. As this anime is, without a doubt, quirky, but interesting on many levels: mainly psychologically. I'd say this anime is not for everyone simply because of how strange it can be, but truly a masterpiece both animation wise, as well as character/plot wise. It was 'Ayakashi' that introduce me to this anime. At first, I thought the art looks kinda weird especially the coloring style. But not so long after that, my opinion changed and I actually like the whole thing, the art and the main character. They depicted a mysterious air and it goes well with the whole supernatural anime. To me, Mononoke got interesting plot and the studio creatively present the whole anime. 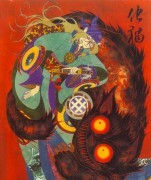 The first time I've ever saw Mononoke was when I watch Ayakashi aired in TV few years ago. I think it's also one of the best anime ever made and it deserve more episode (yeah, I'm greedy.). I have no problem with the artwork, cause for me, it's full of creativity and mysteriousness and it suited the story. Great presentation, in short. Abound with bright colours, yet spine-chillingly horrific, yet emotionally provoking, with its main protagonist ever calm in the face of Death, this is an anime that raises the bar. While not completely flawless, it is honestly, and terrifyingly so extremely hard to forget. Absolutely gorgeous animation, style and character designs. Story gets a bit bizarre in places, but overall a great series. I watched it all the way through in a marathon. I would also recommend Ayakashi: Samurai Horror Tales as a partner series to this one. (As well as presenting) I'd suggest this anime for you. The movement is quite different, and the presentation is much like Kabuki ! But it gives off the creepy aura that you want in a horror anime. Very nicely done actually! Loved it.